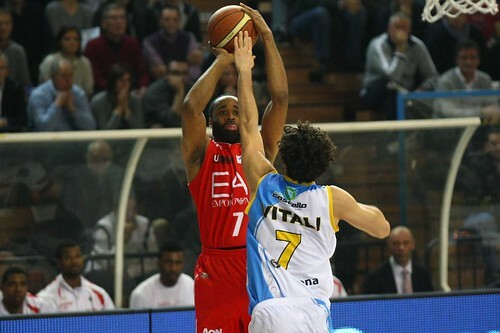 Cheers for Keith Langford, a former local star, second win in a row on the road for EA7 in Cremona. After Siena, Olimpia confirms itself and get back on track, now riding a 50% record waiting for the next road game in Ancona, on Sunday. The good news is that the win came in spite of Bourousis and Gentile being out nursing some injuries and came in fashionable way, allowing everybody to get playing time. If Langford was thea leading scorer, Stipcevic went in double digit again, Hairston scored when it counted the most, early in the third, and Hendrix produced a solid third quarter, scoring 9 points and grabbing 5 rebounds, to get a double double for the game. FIRST HALF – Lance Harris scores the first six points for Cremona but the Serie A leading scorer pushes Cremona up only 4-2. Then Langford scores five consecutive points, a fastbreak finished with a thunderous dunk and a three. Qhen he completes another transition forces Cremona to call time-out when it’s 14-6 Olimpia, in spite of Malik Hairston plagued by two early fouls and forced to sit on the bench. A little later the second foul by Langford slows down EA7 run. The first quarter is over with Olimpia up 16-11. Hairston scores seven points eraly in the second period: after a technical foul called on Peric and two fouls shots converted by Giachetti, Olimpia is getting away. A Stipcevic corner three extend EA7 lead to 10, 28-18, 4 minutes before intermission. Cremona calls time-out and responds, helped by a technical called on Hendrix. Vanoli has a 6-0 run and come backs within 4 in a matter of 90 seconds, then within 3 after a Peric free throw. The second corner three by Stipcevic blocks the run. It’s 31-25 Olimpia at halftime. SECOND HALF – Vanoli is again within 4 because a Stipanovic basket after an offensive rebound, but from the point on Olimpia is in control: Hairston scores on left-handed bank shot, Langford makes a steal and dunks, Hairston scores on a jumper and Langford with a drive (he draws a foul but doesn’t conplete the 3-point play). After three minutes in the second half, there’s the biggest lead, 39-27, and coach Attilio Caja calls a time-out. The margin is extended, touching the 18-point mark three times after four foul shots and a tip-in by Hendrix. At the end of the third Cremona is trying to push and close the gap to 14, 56-42. Hendrix has scored 9 in the third. Stipanovic’s offensive biards are keeping Cremona somewhat in the game in spite of back-to-back threes by Stipcevic and Basile. Then it’s Cook’s turn to make a three and EA7 is entering the last five minutes up by 20, 72-52. So, it’s time to just control the game.